​Welcome to Smoking Meat 101! If you think meat smoking was best left for the barbecue pit masters you need to read on. Smoking meat for beginners is what this guide is all about. Simple step by step methods that will quickly have you smoking any kind of meat like a pro. It is really quite simple and does not require that you stay with the smoker checking the meat frequently. In fact some smokers do all the work for you depending on the type of smoker and meat that you have. Before we get in to the details of smoking, we should look at the types of meat smokers. There are typically two classifications of meat smokers; wet smokers and dry smokers. Note: Purchasing a smoker made from low or light grade material can make it difficult to maintain adequate heat to properly cook the meat. Cylinder Water Smoker - The cylindrical water smoker is available in charcoal, propane or electric fuel sources. This smoker has three racks or trays. The lower tray holds the charcoal (in the case of a charcoal smoker), the middle tray holds the pan of water, and the meat rests on the top rack absorbing the moisture from the steaming water beneath it. Vertical Water Smoker- A v﻿﻿e﻿﻿rtical smoker has vents that can be opened to increase heat intensity. The wider the vents are opened the greater the heat inside the smoker. The vertical water smoker is very inexpensive and the easiest to use for beginners. These types of smokers make it possible to cook everything from a roast to small items like sausages. Whatever choice of wood chips you decide to use, you should soak them in water the night before. This will help prevent them from catching fire when they are on the hot coals and allow them to smoke over a long period of time. If you are using blocks of wood, soaking them in water may no be idea. Check out the myth busting of soaking wood. Next you need to season your meat with either a dry spice rub of your choosing or a wet marinade. It’s usually best to do this the night before to help the seasoning penetrate the meat. You can also inject the meat with a marinade using a meat injector which will further add flavor and moistness to your meat. In the morning prepare your smoker by adding a chemical free pure charcoal - chemical free to the bottom pan (best charcoal for grilling). You could line the bottom pan with newspaper if you desire. Using a long match, light the charcoal and wait five to ten minutes for the coals to get hot. When your coals are hot, you can place a handful of wet wood chips on the coals to start the smoking process. If you put too many at one time, it may lower the temperature of your smoker for quite a while. Fill the pan with water and place it on the middle rack. You should always wear gloves to protect yourself from burns. The last step is to place your meat on the top rack and close the lid. Open the top vents so some smoke and heat can escape. You can also open the side vents, but remember that opening side vents increases the intensity of the heat in the smoker. Smoking meats is a slow process where heat is slowly distributed in the cooking chamber which allows for longer cooking times and more tender meat. Periodically you can rotate the meat to get a more even cook through the meat, but it’s not necessary. You should always use the best smoker thermometer you can afford to make certain the smoke temperatures is no less than 225 and no more than 300 degrees. Depending on the type of meat you are cooking, internal temperatures will vary. The next type of smoker is the offset dry smoker also known as a barbecue pit. This type of smoker usually has a fire box that is separate from the main smoking area. This is the source of the smoker’s smoke and heat. The chimney takes the heat and smoke and delivers it to the main smoking area. The fire box typically holds split wood or charcoal. 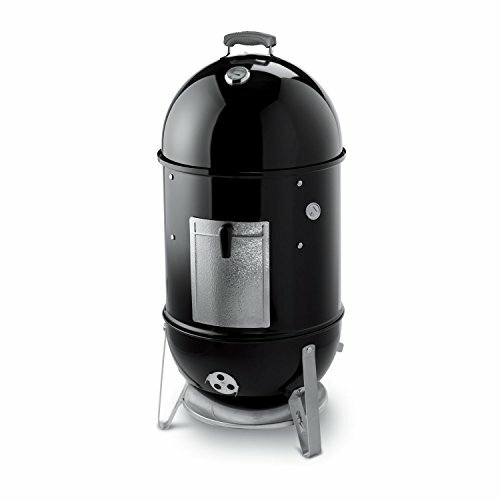 This smoker is preferred over the vertical wet smoker because it provides larger cooking areas and a more intense smoky flavor to meat. However, because it is a dry smoker you will want to slather the sauce on heavily to prevent the meat from drying out too much. Dry heat smoking can quickly dry out the meat making it tough and stringy. Furthermore, dry heat smokers tend to be more expensive, but offer a greater cooking capacity. Wet wood and wood chips can also be placed in the firebox to prevent it from burning too fast. However, you can control the venting of the fire box which will also help control the burn and smoke rate. Most smokers come with a temperature gauge. But the dry smoking method will take a long time and nobody in their right mind wants to sit there watching the temperature for 8+ hours. With that in mind, consider using a digital thermometer. You can use them to keep track of your meat temperature and the temperature of your smoking pit. Digital thermometers go from a wide temperature range of 65 degrees F to 360 degrees Fahrenheit. An additional advantage of this technology is that some can remotely alert you when your smoker needs attention. Some older remote thermometers sound bells and whistles, to alert you when your smoking meat has reached the desired temperature and cooking time. Here is a great video​ by Art of Manliness on the ins and outs of smoking meat. There is some speculation as to whether smoked meats are healthy. Typically smoked meats are high in sodium which is bad for the heart and can cause hypertension. Making your own salt free rubs, marinades and injection solutions will ensure that your smoked meats have a lower concentration of sodium. In a bowl whisk together all of the ingredients until fully incorporated. 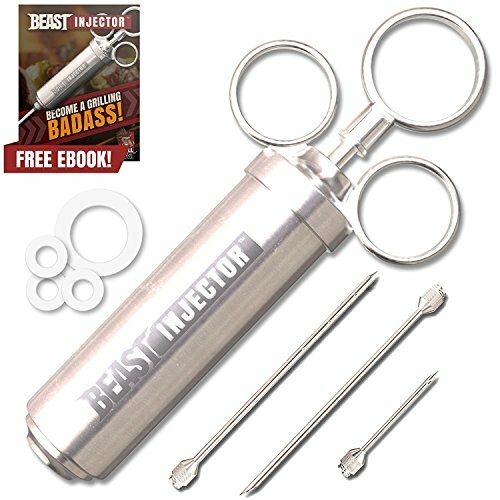 Using a meat flavor injector, draw up a syringe full of the marinade. Insert the injector needle halfway into the meatiest areas of the meat. Depress the plunger to inject your marinade, repeat until all the solution has been used. By injecting the marinade the meat will retain moisture and flavor. Don't be afraid to experiment, that's the fun part of smoking meat! Water smoking can help regulate the temperature when you’re smoking a big cut of meat that will need to cook for many hours. For smaller cuts of meat that don’t have a long cooking time, it’s not necessary to use water.